Last month, Lambeth council controversially announced that it was looking into funding food banks to provide for local people in crisis as a result of cuts to their social fund budget. Izzy Koksal explains how this shifting of responsibility onto charities raises strong concerns for the provision that the most vulnerable in our society will receive. On Saturday morning, three people are already sitting outside the church in Lambeth in south London waiting for the food bank to open. Kate, who organises this food bank in Lambeth, says that there have been queues outside for the last couple of sessions. There has been a significant increase in the number of clients using the food bank since it opened in January - with an average of six clients per session handing over a voucher that will provide three days of non-perishable food for their family. Each client is given a voucher by a key worker – social services, job centre advisors and other frontline workers. People are limited to a total of three vouchers a year, because the food bank network is a response for people in crisis. Yet - people's crises often exceed the nine days that the three vouchers will provide for. One volunteer tells me that if this is the case, this rule is overlooked. Two days a week for three hours, the church hall is turned into a cafe space with a back room acting as the warehouse where the food, donated mostly by individuals, is packed into carrier bags for each client. The shelves look well stacked with food of varying quality. There is a strong presence of supermarkets’ ‘basics’ and ‘economy’ ranges. A volunteer hesitantly puts a child’s Disney Princess toothbrush into a bag for a grown man. The manager strolls in at one point to oversee the volunteers at work. ‘We’re almost out of chocolate’ one volunteer tells another. ‘Chocolate is a luxury’ the manager replies firmly. But by the end of the day, the shelves are almost bare. A volunteer exclaims worriedly ‘we’re out of everything! We had to start missing items off the list. We ran out of milk, squash, tinned fruit, and soup’. They will do an urgent call out for more food for the next session. This food bank is one of hundreds that have sprung up all over the country as part of the Trussell Trust network, a Christian organisation that aims to combat poverty and exclusion. With the recession, cuts and insufficient support for the most vulnerable in society well before the cuts onslaught, more and more people are finding themselves unable to afford food. Kate says the food bank opened after people realised that there were members of their church ‘who didn’t have any food and were struggling to get by...we realised this was a really good way to help people’. The people visiting the food bank are ‘quite a wide range,’ Kate says. ‘It could be anyone. It could easily be me’. One main reason why people end up at the food bank is benefit delays. Low incomes, homelessness and a protracted asylum process are other reasons. While most politicians, including Ed Miliband, try to paint our welfare system as bloated and excessive with their ‘something for nothing’ mantra, the reality is very different. As Nick, who is currently waiting for his sickness benefits to come through, puts it: ‘when they want money off you, they take it like that (he clicks his fingers) but when it’s their turn to pay out, they take forever’. Nick's benefits had been delayed for weeks. During that time, his fridge had broken down. He asked for a crisis loan for another fridge - but it was not considered an emergency. ‘Perhaps they think it’s so cold outside I can keep my food there’. He was told that he couldn’t get a loan, but could get food from the food bank. Another young man who had been sanctioned by the Job Centre had also been refused a crisis loan and instead given a food voucher. There worry is that offering food vouchers may be seen as the easier option rather than providing claimants with the benefits they are entitled to. For Nick, government money failing to materialise where it is needed was becoming a pattern. He told me how Nick Clegg had visited the addiction charity that he attends, promising funding. ‘But we never saw anything. They’re all liars’. A woman enters the hall with her child. It’s the school holidays, so children are accompanying their parents to the food bank. Fortunately, Miguel, who is aged seven, notices a poster with flags of the world on the wall and we spend our time trying to identify the different countries. His mother explains that they'd lost their home - their landlord wanted to sell it suddenly after being diagnosed with a serious illness. Lambeth council has since sent them from temporary accommodation to temporary accommodation. This has been extremely difficult for her and her son. She described how ‘the council have been very slow [in helping her]...they don’t care’. She was particularly concerned about her son at school.‘If it was just me, I wouldn’t mind so much, I’d be able to deal with it, but I worry for my son’. Rose is worried that she will be moved out of the women’s refuge where she is living. ‘They want to move us out and they’re going to set up a different hostel there. I don’t know where they’ll put me, but I don’t want to return to a hostel. I’ve come so far since then.’ A child approaches her with a drawing of a dragon that he has done. She admires it and then suggests to him that he add fire coming out of its mouth. ‘I don’t know how I’ll get a job. No employer will want me. I’ve got a criminal record. I’ve got a very colourful past. I’ll start with volunteering and hopefully through that I’ll get a job’. While Lambeth council drags its heels in housing residents, it is able to find resources to support the food bank. David tells me about a recent meeting held with a council worker where they explored how to coordinate with supermarkets and local markets to direct leftover food to the food bank. 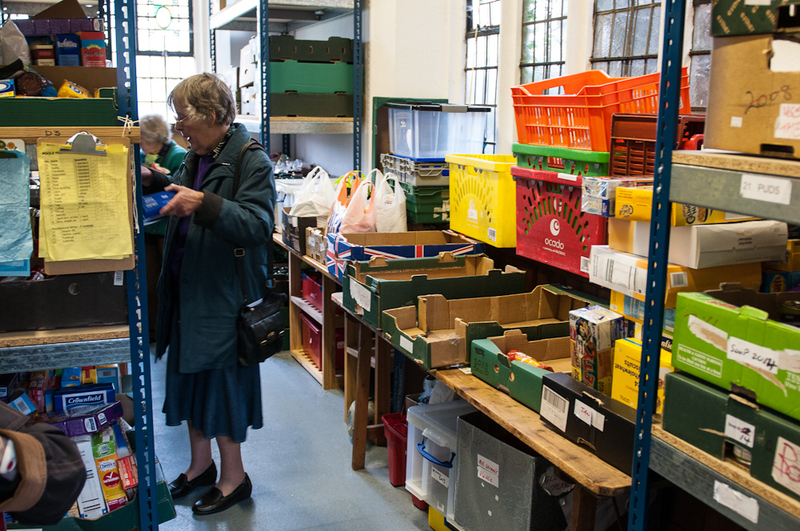 Lambeth council hit the national headlines last month with an announcement that it had spoken with food banks about providing financial support to boost their capacity. They claimed they were doing this while ‘holding their nose’, because they were uncertain that foodbanks were a sustainable response to poverty. In a statement, Cllr Lib Peck said, “We are talking to a range of local charities – including food banks, advice agencies, furniture suppliers and the Credit Union - about how to meet those needs although we have not yet made any firm decisions.” I did not receive a response to my question to Lambeth council about why the provision of emergency crisis loans was not being treated as an absolute priority for the council. No doubt this will be hailed as an example of the much lauded ‘co-operative council’ – in reality a friendly sounding cover for the cuts – where community groups are encouraged to run public services with significantly reduced funding. Food banks are becoming common features in many people’s neighbourhoods – but they must not become a normalised and accepted part of the landscape. In the food bank I visited, organic goose fat from a Christmas hamper sat on the shelf, a manager declared chocolate a luxury, a man found himself with a Disney princess toothbrush, and a woman looked through the ‘take at your own risk’ box containing food past its sell by date, telling the room ‘I’m not ashamed’. Back in the late 1700s, an old resident of this borough - William Blake - raged against poverty in ‘a rich and fruitful land.’ Centuries later, we are still living in that ‘land of poverty.’ Now is the time to rekindle that rage.